The HP Series 80 was a family of small desktop personal computers. Each contained an advanced version of BASIC in ROM and four expansion ports. The first to be introduced and apparently the most popular of the series, this model featured a crisp built-in 6" B&W CRT that displayed 16 rows of 32 characters or 256x192 pixels in graphics mode. It also had a thermal printer and a tape drive. A touch of a key could copy anything from the HP-85's display to its printer. 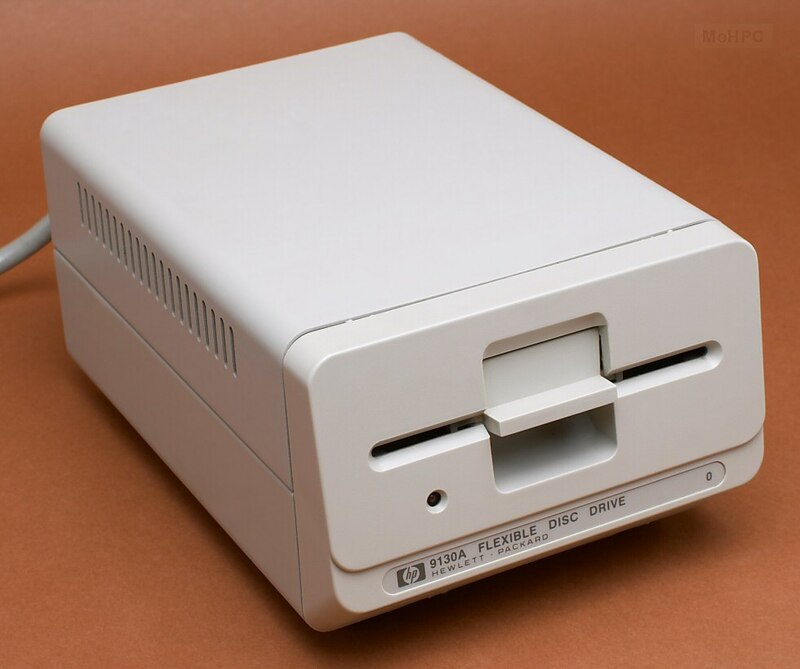 The built-in tape cartridge drive held up to 210K bytes. It had a search speed of 7800 bytes/second and a data transfer rate of 650 bytes/second. When the machine was turned on, it looked for a program called "Autost" on the tape and executed it if found. The HP-85 came in versions with 16K or 32K of user program RAM. The HP-85B which was introduced featured the Mass Storage and I/O ROMs built-in. For faster access, an electronic disc was also included in the B version. This disc held 32K bytes (in addition to the 32K of main memory) as shipped but could be expanded up to 544K bytes with plug-in modules. 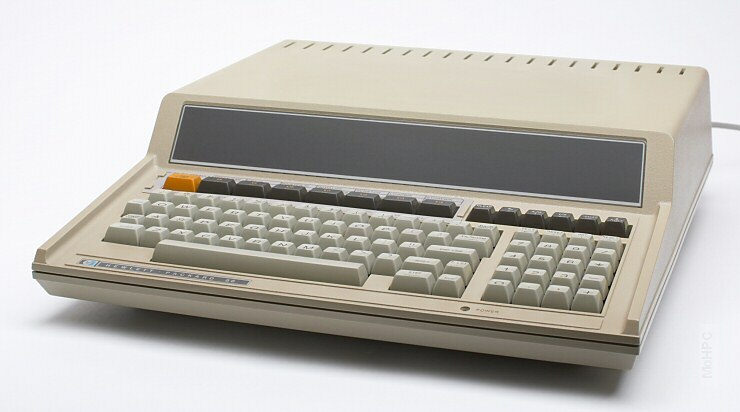 The Series 80s allowed subroutines to be executed from mass storage devices so the electronic disk made it possible to write large programs that ran quickly. This model was similar to the HP-85 but omitted the printer and tape drive. 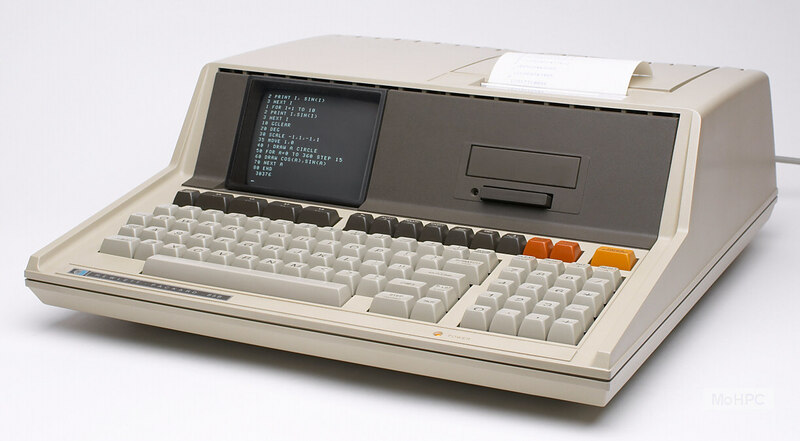 This low-slung model omitted the CRT display, tape drive and thermal printer of the HP-85. An external monitor could be driven via its composite output and there was a provision for adding up to two external disk drives and a printer. The HP-83, HP-85, and HP-86A did not have built-in HP-IB but HP-IB support could be added. (HP-IB was built-in to the HP-86B, HP-87 and 87XM) The HP-86 was available with 64K or 128K of RAM. These models featured a wider CRT that displayed 16 rows of 80 character lines. (Graphics mode was the same with the image centered in the display.) 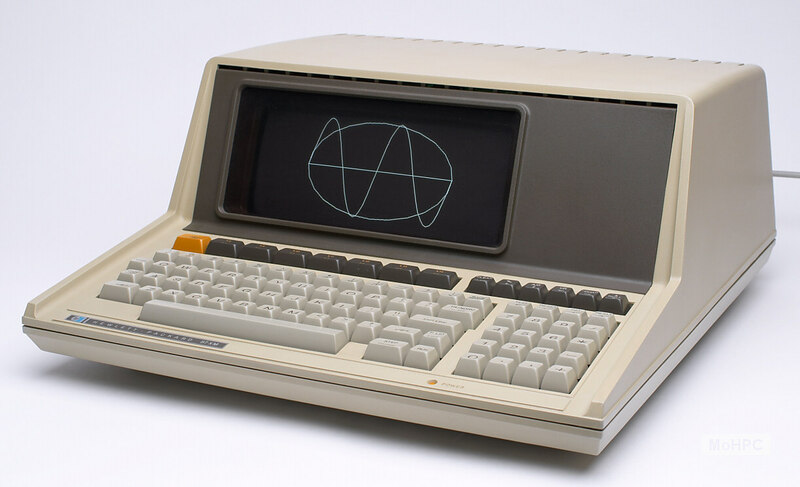 This wider display precluded the inclusion of a tape drive or printer but HP-IB was built in which allowed the connection of up to 14 devices including disk drives, printers, plotters etc. The HP-87 came with 32K of RAM. The HP-87XM came with 128K RAM all configured as user program memory. An industrial relative of the 80 series. Essentially this was a rack mountable HP-85 minus the keyboard and CRT but with the I/O ROM and Program Development ROM built in. Each of the Series 80 models had a typewriter style keyboard with a numeric keypad. Above these keys there was a row of special function keys. The keys to left and under the CRT were soft-keys that were program-controlled and could be labeled on the CRT. The keys to right performed dedicated functions like moving the cursor, toggling insert/replace mode, copying the display screen to the printer etc. The displays used a kind of "forms interface". The user could re-execute any command on the screen by moving the cursor to the line (and editing it in necessary) and then pressing the End Line key. If the desired line wasn't on the screen, the user could use the ROLL Up/Down keys to review the last 48 lines, then move the cursor to the appropriate line and press End Line. While the HP-80's had a BASIC interpreter, they could also be used as algebraic calculators. An expression typed by itself with no assignment or line number was understood as an expression to evaluate. A lot could be added to the Series 80 computers. Options included floppy and hard disks, printers, plotters, ROM and RAM modules, a Speech Synthesis module, a System Monitor (machine language debugger) module, and interfaces for many I/O devices including parallel, serial, HP-IB (standard on some models), HP-IL, GPIO, BCD, DSN/DL Data Link Interface (for interfacing to HP 1000 and HP 3000 computers), a modem etc. Four modules could be plugged into the back. A ROM drawer was a special module that served as a carrier for up to 6 small ROM modules. A programmable ROM drawer which held EPROMs was also available for permanent storage of user programs. Another interesting option was the CP/M system. This system added a Z-80 processor, 64K of RAM and floppy discs and could only be plugged into an HP-86 or 87/87XM system. The HP-80's used a very powerful version of the BASIC language. Data types included strings, integers, shorts and reals. The interpreter supported subroutines, functions, common data and a variety of powerful features including the ability to set and respond to timers. Many modules were available to expand the programming language of the HP-80 series. Some examples follow. Note that the HP-85/85B and the HP-86/87 require different modules. HP-85-style ROMs have white printing and HP-86/87 style ROMS have orange printing. Contained the disk operating system. Drives were connected via the HP-IB interface. This ROM provided BASIC MAT functions and also added additional array support. Functions included MAT INPUT, MAT PRINT, matrix math including transpositions, inversions and cross products etc. This ROM supported the attachment of external printers or plotters to the Series 80s. It added several new graphics commands to the BASIC language. This ROM allowed users to write assembly language programs. Once assembled, programs could be stored in the file system of any mass storage device or programmed into PROMS or EPROMS. In addition to standalone programs, the user could use this ROM to extend the BASIC language of the Series 80 computers. "Your HP-85 is another example of the award winning design, superior quality, and attention to detail in engineering and construction that have marked Hewlett-Packard instruments for more than 30 years. Each Hewlett-Packard computer is precision crafted by people who are dedicated to giving you the best possible product at an affordable price."